Right-click the object you want to export and select Export from the context menu. (Alternatively, you can select Access from the Export group on the External Data tab of the Ribbon.) The menu appears as in Figure 1. Figure 1. After selecting Export, you can designate the type of file you want to export to. Select Access. 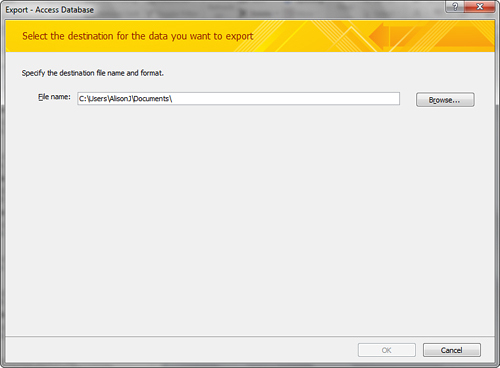 The Export – Access Database dialog appears (see Figure 2). Figure 2. 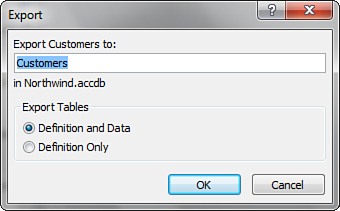 The Export - Access dialog box allows you to designate the destination database. Select the Access database to which you want to export the object and then click OK. 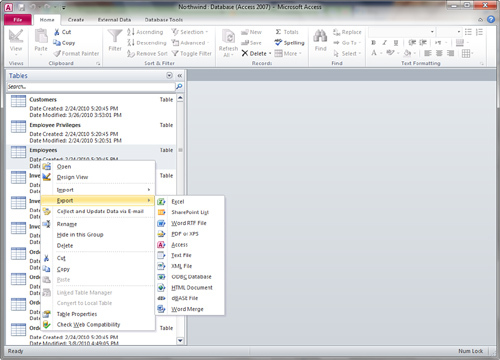 The Export dialog box appears (see Figure 3). Figure 3. The Export dialog box allows you to designate whether you want to export the definition and data or the definition only. In the Export dialog box, select Definition and Data or Definition Only, depending on whether you want to export just the structure or the structure and the data. Click OK. When you export an object to another database, Access exports a copy of the object. When you choose Definition Only, Access copies just the object’s structure (no data) to the receiving database.